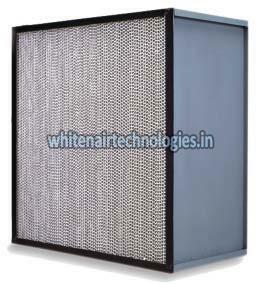 Our company is a distinguished Manufacturer & Supplier of Low Temperature HEPA Air Filter from Telangana, India. To cater to variegated demands of the customer, we offer the Air Filter in various sizes and materials. We check the HEPA Air Filter on a number of standards and parameters to ensure customers obtain a quality assured product. HEPA (High efficient particulate Air) Filters rated 99.99% efficient with particles of 0.3 microns and larger in diameter. Filter Frame : Anodized Aluminium, SS 304.